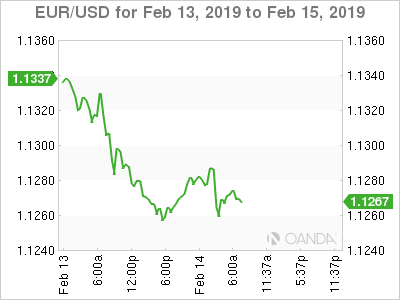 EUR/USD has ticked higher in the Thursday session. Currently, the pair is trading at 1.1272, up 0.10% on the day. In economic news, it’s a busy day. German Preliminary GDP improved to 0.0%, shy of the estimate of 0.1%. Eurozone Flash GDP posted a second successive gain of 0.2%. On the employment front, eurozone flash employment change edged higher to 0.3%, above the forecast of 0.2%. In the U.S., the markets are braced for a slowdown in consumer spending. Retail sales and core retail sales are expected to dip in January, with readings of 0.1% and 0.0%, respectively. PPI is forecast to post a gain of 0.1% and preliminary UoM consumer sentiment is expected to climb to 93.3 points. Economic activity in the eurozone remains weak, underscored by GDP releases in the fourth quarter. German Preliminary GDP was flat at 0.0%, after a decline of 0.2% in the third quarter. The eurozone’s largest economy managed to avoid a technical recession, which is two consecutive declines in quarterly growth. Germany’s manufacturing industry is limping, with factory orders and industry production posting declines in December. Eurozone Flash GDP remained stuck at 0.2%, shy of the forecast of 0.3%. On an annualized basis, fourth quarter growth was 0.9% in Germany and 1.2% in eurozone, both weaker than the third quarter numbers. If eurozone and German data continues to sag, traders can expect the euro to lose ground in the near term. The U.S-China trade spat has triggered a slowdown in China’s economy, which has dampened global growth. There was positive news on Thursday, as China announced that exports had jumped 9.1% in January on an annualized basis, compared to the forecast of -3.2%. This was a strong rebound from December, when exports fell 4.4%. Despite these rosy numbers, the outlook for global growth remains weak. Much will depend on whether there is a breakthrough in trade talks between the U.S. and China. President Trump has said that he could suspend the March 1 deadline to impose new tariffs on China, if the negotiations continue.